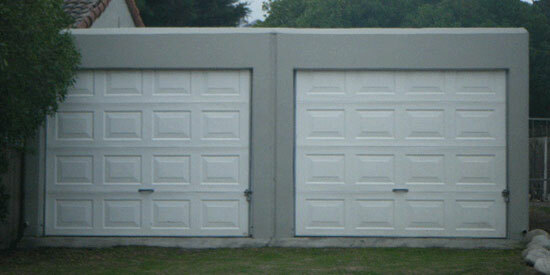 Fibreglass doors are fabricated using moulded fibreglass to create the garage door panels. Fibreglass doors can be used in areas close to the sea, as the fibreglass will not be weathered by the salty sea air, the sun however can fade fibreglass after many years and it is important to remember that fibreglass doors have a galvanised steel frame riveted around the door. The fibreglass sectional overhead doors are available in either a horizontal slatted or cardinal (block) panels. It is however, important to note that if you opt for the blocks and your door is not a standard size, you should consult your installer as to whether the blocks will be cut off, either on the sides or at the top of door, in which case, you should probably have a horizontal slatted door installed. 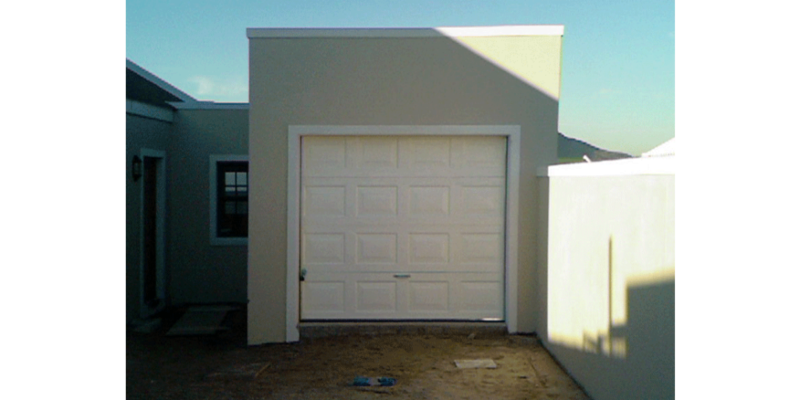 Sectional overhead garage doors require 450mm head room, from the bottom of the lintel to the bottom of the ceiling or rafters, for installation. This amount of head room must follow through 3m back into the garage. It is possible to install a sectional door with a minimum of 250mm head room, however this will require a flip over panel to be installed. Flip over panel simply means, that when the door is in the closed position, the top panel will still be in a slanted open position, which the motor will then push closed onto the lintel. Therefore, if a flip over panel is installed, a motor is essential to the door closing fully. Fibreglass sectional overhead garage doors have a rubber seal inserted onto the bottom of the garage doors which the door to get a complete seal on the bottom floor, preventing far more dust etc, from entering the garage. Side seals are also available to be installed on the outside of your garage door, on either side. These are used to completely seal the door from the outside elements, as the rubber seals are placed up right up against the door. 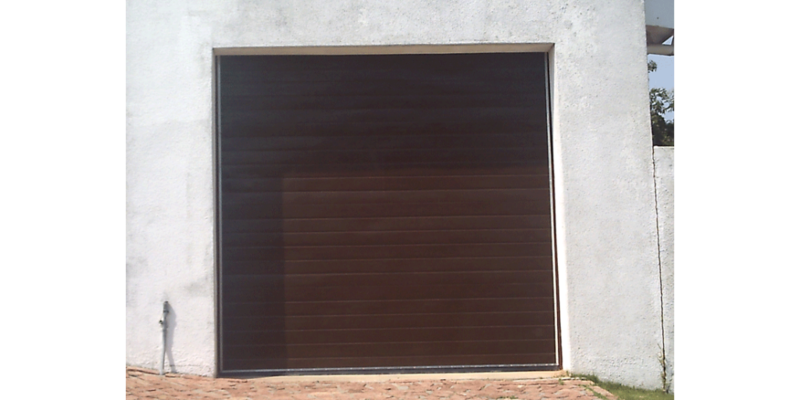 A sectional garage door should sit 10mm away from the garage walls, in order to prevent the door scratching on the walls or getting caught on the wall, preventing the door from sliding smoothing up and down. Greasing the doors’ hardware is not recommended as the grease forms a grinding paste with dust and sand particles, which encourages rust and decay. These doors are very light-weight that will help prolong the life of the doors hardware and the fibre panels require no maintenance. Fibreglass tip up doors are available in either a horizontal slatted or cardinal block (block) panels. It is however, important to note that if you opt for blocks, and your door is not a standard size, you should consult your installer as to whether the blocks will be cut off, either on the sides or at the top of door, in which case, you should probably have a horizontal slatted door installed. Fibreglass tip up doors have a visible galvanised steel strip on the edges of the tip up garage door. Horizontal slatted fibreglass doors are more expensive than raised and fielded garage doors. 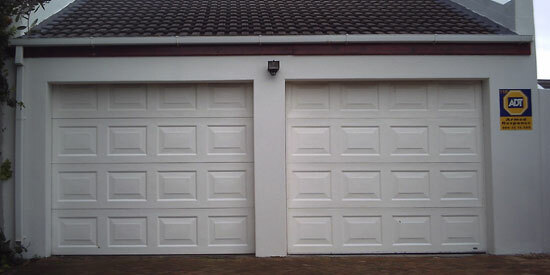 Tip up garage doors need 200mm head room, from the bottom of the lintel to the bottom of the ceiling or rafters in the garage, for installation. When the fibreglass tip up door is in the open position the garage will lose +/- 100mm from its height. All tip up garage doors have springs and hinges that should be regularly sprayed with silicone spray or Q20 in order to help maintain a longer lifespan of the tip up door hardware, as well as preventing rust erosion and sticking hinges. For a quote on a Fibreglass Garage Door, contact LHV Garage Doors & Gates today!